Habitat: Coniferous forests, preferring habitat that includes spruce, fir, or cedar. Also found in mixed coniferous/deciduous woodlands. Winter habitat is the same for resident population. Birds that move southward during the winter may also frequent deciduous woods, orchards, parks, and suburban areas. Diet: During breeding season, mostly bark insects and spiders and their larvae, especially beetles. Nestlings are also fed insects. In the winter, seeds of coniferous trees and sedges. 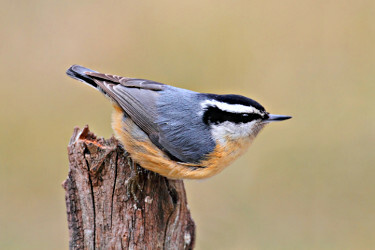 Red-breasted Nuthatches are attracted to feeders with black oil sunflower seeds, hulled sunflower seeds, peanuts (whole or hulled), and suet. They especially enjoy suet containing peanut butter. These birds will come to tube feeders, hoppers, platform feeders and suet cages.